I read the shocking plight of Jawahar Manjhi, a farm labourer in Bihar, working for 27 years to reply a loan of about 40 kg of rice for a family wedding. Those 40kgs turned out to be slave food. They agreed that he would work for a day for each kilo. Even for a slave, food is still a necessity. Today, 27 years later, he has needed to borrow more rice, and is still working to repay his loan. The police are currently investigating this story, but if it turns out to be true, it will be another highlight on the huge economic and living conditions gap in the different social classes in India. Bonded labour was banned in India in 1976 – some 30 years ago, but there have been few prosecutions of violators over the years. Anti Slavery International says that such exploitation is commonplace in India. And it is true isn’t it? 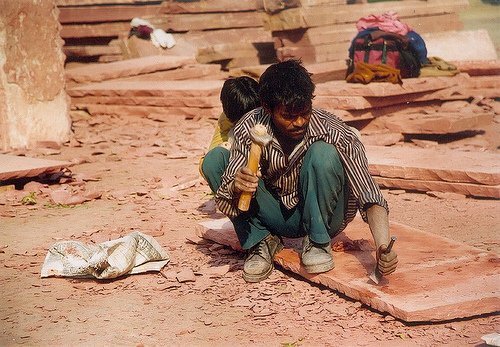 Even Child Labour was taken strong action against last year, but how many people were actually caught? How many children were rescued? I have no clue. If anyone knows, I would welcome this information. All I can see is that there are plenty of children still working on the streets – washing dishes on food stalls, selling newspapers, shining shoes, …….. So what has the law really done? It is not like isolated cases that the police miss. It was a huge thing for a couple of days, and then life was back to normal. 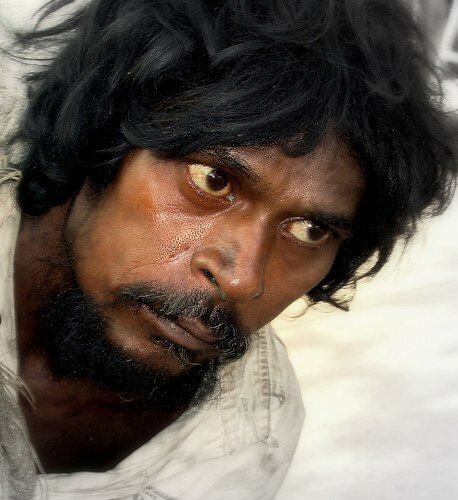 One incident I remember is the story of Palabakam in Tamil Nadu, a village of bonded slaves mostly belonging to the Irula tribe rescued from the rice mills in the year 2004 (I think). The government supported them after activists brought the matter right into their faces and made any other action an embarrassment. Otherwise, they had been happy to ignore the Irula plight and deny that there was any problem. 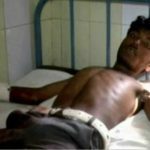 A more recent shocking incident is the cutting off of the hands of two labourers when they refused to work in brick kilns in Chattisgarh after being contracted to work in Andhra Pradesh. Somewhere down the line, I think it comes down to all of us as citizens to speak up on the things we see happening as they shouldn’t around us. If we can file reports of every child labourer on the streets that we see, there will be a time when the police will be answerable for the sheer number of reports piled up and their progress against them. This is something we should be making an effort about. Nothing horrifying about seeing a child selling newspapers. Let’s get some perspective. Selling newspapers is a common job for 10 and 12 year old boys in America. Or was, before such jobs were taken over by adults with cars. A friend of mine is apprenticing a teenaged boy who has no education. He gets paid about 30 Rs per day, which I thought was rather low. “But he’s getting trained for free” was the response. Who am I to judge? Will I pay laks of money to bribe an educational establishment and pay fees and related costs so the kid can get a “real” education? No. So who am I to judge? When you see a child working and it gets you so angry you want to rip him or her out of the establishment, tell me, are you angry enough to pay for the food going into that child’s mouth? Will you personally pay the bills? Everyone wants to be outraged, but nobody wants to pay the bills. There is no nuance in the anti-child labor movement. If we’re supposed to be outraged by children selling newspapers, all or nothing must be the attitude. 1. Improve working conditions and wages. 2. Insist on education for young people. 3. Give more opportunities, not less, to put food on the table. The problem of exploitation is entirely separate. Child labor is not in itself exploitative, even if often it can be. “Unfortunate” and “exploitative” are worlds apart. Parts of India are still in the dark ages. How is it better than fiefdom? I know when housemaids are hired to work in the houses, they themselves are a problem. No matter how many times they are told not to bring children with them to work, they bring them and make them work more than half of their share. Most of these children are not even their own, they are probably far off relatives or even just belonging to the same village. Lots of times elderly people of the household because they give in and not argue because they are dependent on this help. These maids can be really bossy and not clean on the top and they make a big ruckus. They also threaten that she will not allow anyone else to work in the house if she is not allowed to work the way she does. The whole system needs to be looked at with a new perspective.